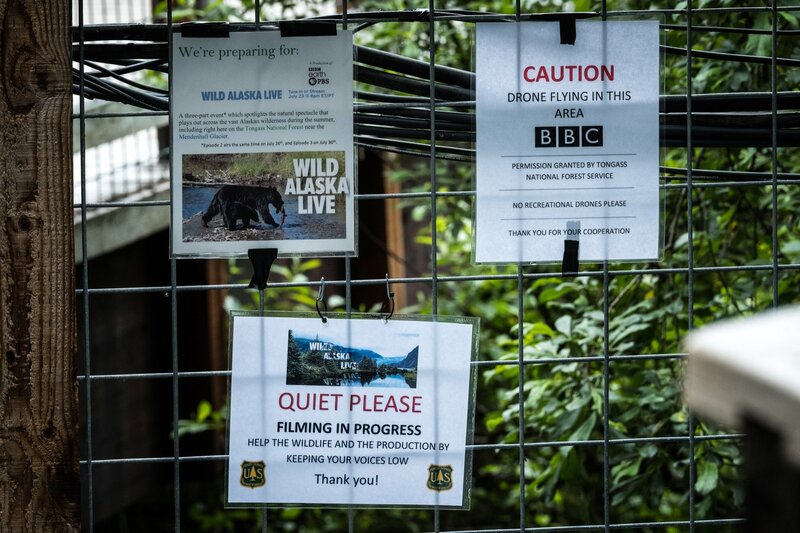 What Wildlife Will I See in Juneau, Alaska? 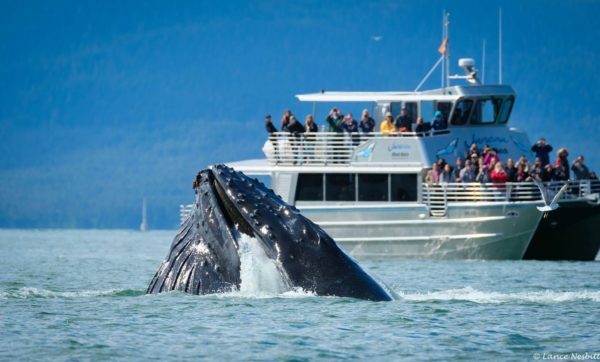 Here in Juneau, you’ll find a wealth of wildlife: there are more animals than people! 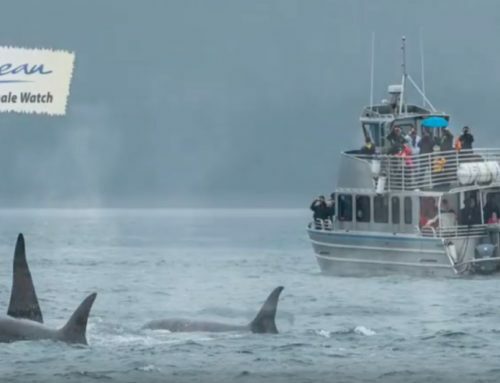 On the water, expect to see humpback whales and the occasional orca (killer whale). Our whale-rich waters are also home to Dall’s porpoises and harbor porpoises, Steller sea lions and harbor seals, sea otters and beavers. On land, Juneau provides natural habitats for porcupines and mountain goats, often spotted grazing on the grasses. And gloriously, a bounty of bald eagles and other birdlife–resident and migratory–can be seen soaring the skies. Of course, our capital city and borough is Bear Country so generations of black bears live here too, which are attracted to the salmon when they come into spawn. The North Pacific population of humpbacks are enormous creatures: about 40 to 45 feet (up to 60 feet!) and around 25 to 50 tons of stout whale. That’s about a ton per square foot, akin to the size of a bus. Or 8 elephants. Or circa 10,000 house cats. 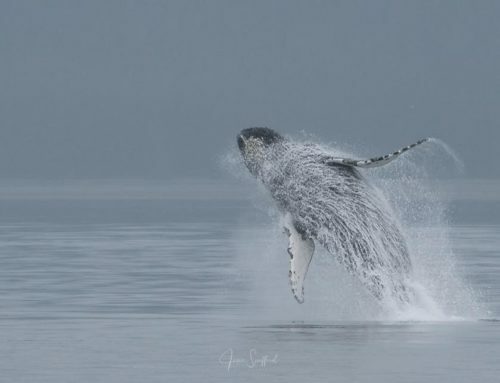 Living up to 50 years and scientifically known as “Megaptera novaeangliae”, they are easily identifiable by their: abnormally large pectoral fins (flippers that reach up to 15 feet), big fanned tail and hump-shaped back with a small black dorsal fin. As mammals, they’re air breathers that have to come up for air every 7 to 15 minutes. 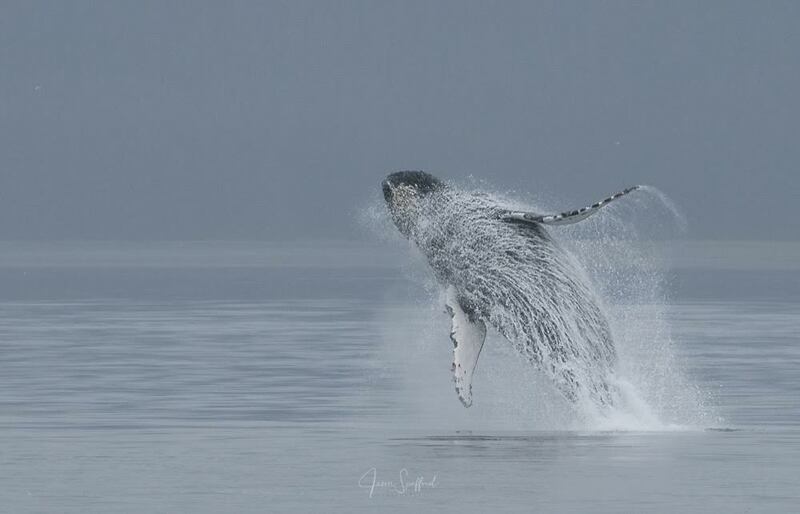 Humpback whales are well known for their leaps and breaches, lunge-feeding, lob-tailing, peck slapping and rolling. Incredibly, they migrate more than 3,000 miles on their annual journey starting in Hawaii in the North Pacific Ocean and end up in Juneau’s nutrient-rich waters to feed. As seasonal feeders and carnivores, they gain around 12 pounds per hour and can eat up to 1.5 tons of food per day; namely filter feeding on an unlimited buffet of tiny crustaceans like krill, and small fish such as herring. Who can blame them when they don’t eat for 6 months of the year! Check out our post on bubble-net feeding to discover how they perform in this fantastic spectacle. Gloriously as much as sustainably, the population we see in Juneau’s protected waters was delisted on the Endangered Species Act in 2016. 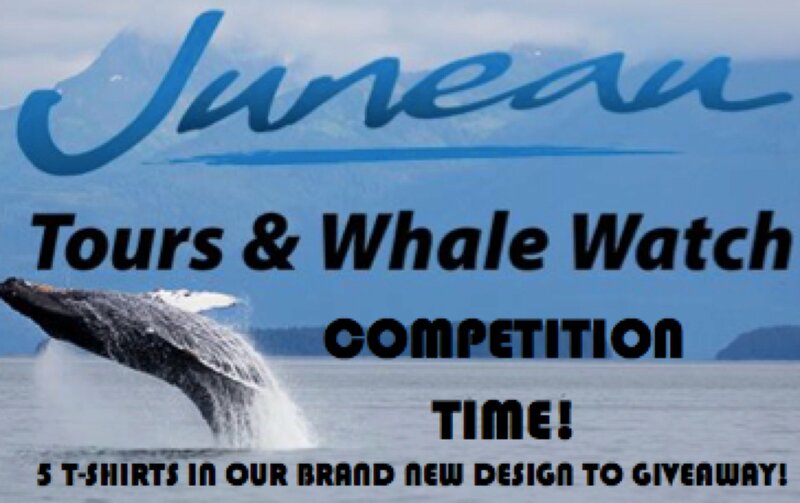 Can you guarantee to see whales? Commonly known as killer whales (Orcinus orca), these monochromatic beasts belong to the oceanic dolphin family where lifespan varies as much as 50 to 100 years. It’s no surprise to learn orcas are the largest dolphin member, where females and males reach respectively: up to 8.25 to 11 tons, and 28 to 32 feet. Orca’s use of dialects and the passing of other learned behavior from generation to generation have been described as a form of animal culture. Resident populations love to dine on the local salmon, whereas the transients prefer seals, sea lions, porpoises and other pinnipeds and cetaceans. While more elusive than humpback whales, the killer whales are very distinctive: a male’s dorsal fin for example, can reach lofty heights of up to six foot. 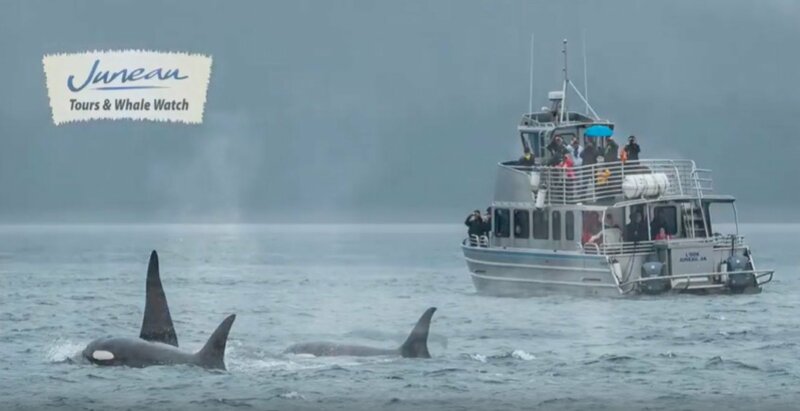 About one in every ten whale watching trips, we see an orca. It can take time to spot these somewhat elusive and fast moving creatures; understandable when we know they can cover 100 to 200 miles per day! Juneau is home to both resident and transient pods of orcas. Native peoples revere such marvels of the ocean, often depicting them heavily in Southeast Alaskan culture. The Whale is a popular symbol for romance as they mate for life. The Whale, like the Wolf, stays with its family and travel in large pods. Indeed, the Killer Whale is said to have originated from a single great white wolf that leaped into the sea and transformed itself into a Killer Whale. That is why they have the white markings on their sides, travel in packs and are such skilled hunters. Dall’s porpoises (Phocoenoides dalli) are high-strung, fast swimming creatures, and black with a striking white patch on the belly and flank. They have a small triangular dorsal fin and the posterior margin of the tail flukes are fringed with a grayish-white band. At around 480 pounds, Dall’s porpoises feed on anchovies, herring, hake, smelts, squid, octopus, and occasionally crabs and shrimp. Reaching 7 to 8 feet long, they’re usually smaller than dolphins, and without pronounced melons or beaks. Unless you know a lot about dolphins and porpoises it is easy to confuse them. Irrefutably, Dall’s porpoises are avid “bow wave riders.” Oftentimes, we see them catch free rides on the bow-waves of our boats. When swimming at high speeds, Dall’s porpoises create fan-shaped splashes of water, called “rooster tails”. They live typically between 15 and 20 years. Harbor porpoises (Phocoena phocoena) are shy, elusive sea mammals whose typical lifespan is around 24 years. As their name suggests, they prefer the shallows, less than 500 feet deep although will dive deeper, but they usually stay near the surface, coming up frequently to breathe. Commonly seen in Juneau’s harbors and bays, harbor porpoises are also known to frequent nearby rivers, estuaries, and tidal channels. They weigh between 135 to 170 pounds, reach a length of 5.5 feet and feed on herring, capelin, and cephalopods. Bigger than harbor seals, Stellers (Eumetopias jubatus) are the largest of all sea lions with an appetite to match. Incredibly, females and males reach up to 770 pounds to 1.25 tons respectively, and 9.5 to 11 feet long! These giant pinnipeds hunt fish, squid, octopus and, rarely, smaller seals. Steller sea lion breeding is one of nature’s great mass spectacles. When these giants thunder ashore, their favored beaches, called rookeries, disappear under their numbers. Young pups are sometimes crushed by the throng, unheeded by powerful males with only a single purpose in mind. Bulls (males) must establish and hold a beach territory in order to breed. Most do not achieve this until they are 9 or 10 years of age. Average lifespan is 20 to 30 years for males and females respectively. Scientifically known as “Phoca vitulina”, harbor seals are brown, tan, or gray, with V-shaped nostrils and have a rounded, spindle-shaped body. Spots or rings are visible on the dorsal surface (backside). The body and flippers are short, with a large, rounded head, which may explain why they move by a caterpillar-like motion. An adult can reach a length of 6 feet, a mass of up to 245 pounds and lives typically between 25 to 30 years. Females are generally smaller than males but usually outlive the males by up to ten years. The harbor seal can plunge 300 feet and stay underwater up to 28 minutes. As carnivores, seals primarily prey upon mainly fish, shellfish, and crustaceans. They do not chew their food; they either tear it into chunks or swallow it whole in one gulp! Harbor seals are curious but shy animals that prefer quiet, unpopulated areas. Far from a hard life, seals like to “haul out” on Juneau’s protected beaches, spits, bars, rocks and log rafts to bask in the sun and sleep. Rest, digest food, give birth, or nurse their young. At the slightest sign of danger, they will slip back into the water and swim away. A fatty tissue called “blubber” keeps them warm. As an integral part of the avifauna of the 49th state, bald eagles are America’s great wildlife success story. Due to the use of DDT as a pesticide, eagles along with many raptors were near extinction 40 years ago. But the banning of DDT by the federal government and habitat protection afforded by the Endangered Species Act have not only brought this American symbol back from the brink, but seen them thrive. Heck, they’re like pigeons in Juneau! There are thought to be as many as 10,000 bald eagles in the Tongass National Forest. This is the largest concentration in the world. The Alaska population is estimated at 30,000 birds. Far from an endangered species today, the bald eagle (Haliaeetus leucocephalus where the name raptor comes from a Latin word “rapere” meaning to grip or grasp), is the national emblem of the United States of America. It is in the Falconiformes, an order that includes falcons and hawks. When viewed up close, bald eagles appear to be as large as a big dog, especially when they spread their 8-feet wings and reach up to 15 pounds. It’s no surprise that the baldie is Alaska’s largest resident bird of prey. Bald eagles acquire the characteristic white head and tail by the time they reach 5 years of age. An adult eagle has yellow feet and matching beak, and yellow to silver eyes. In a dive, bald eagles can obtain fantastic speeds of 100 miles per hour. On average, bald eagles live around 20 years. Amazingly, the eagle builds the largest nest of any North American bird, up to 8-feet across and weighing as much as a ton. The highly developed talon of the hind toe is used to pierce the vital areas of prey while it is held immobile by the front toes. It’s a common misconception that eagles cannot let go of their prey: the talons’ grasp is purely voluntary. An eagle will sometimes grab a fish that’s too heavy to lift and will chose to swim, towing the meal to shore, rather than lose it. It can lift about 3 or 4 pounds. The bald eagle is a powerful flier, and soars on the thermal convection currents. It reaches speeds of 35 to 43 miles per hour when gliding and flapping, and about 30 miles per hour while carrying fish. Its dive speed is up to 99 miles per hour! In Southeast Alaska culture, the noble Eagle is seen as a symbol of power and prestige. Eagle also has a strong connection to peace. This species is still plentiful in the Pacific Northwest. They have long been a source of artistic inspiration for both traditional and contemporary Native artists. Eagle is considered an important Clan crest and is frequently depicted on totem poles, masks, prints and jewelry. Eagle down is considered sacred, and was used in ceremonies to welcome someone in friendship. “Down” was sprinkled on the ground before an important visitor came into the tribe. Eagle feathers are used for smudging and praying. The feathers were also given as a symbolic offering to bestow for acts of courage and wisdom. Interestingly, mountain goats (Oreamnos americanus) are not in the same genus as goats. In the bovidae family, mountain goats are associated with antelopes, gazelles and cattle. They live in alpine and subalpine environments where the high elevation protects mountain goats from predators. In the summer, mountain goats stay above the tree line and migrate to lower elevations in the winter. Most people know that baby mountain goats are “kids”, males are “billies” and females are “nannies”. Just shy of their two year birthday, you can tell the age of a mountain goat by counting the rings on their horns. Not unlike trees. They reach up to 5.5 feet, can exceed 300 pounds and their average lifespan is 9 to 12 years. The black bear (Ursus americanus) is the smallest of the three species in America (after the polar and grizzly—neither of which are resident in Juneau). Weighing in at 150 to 300 pounds, black male bears have been recorded to reach well over 600 pounds! Predominantly, they live in forests, feeding on salmon, fruit, nuts, shoots and vegetation. Black bears are excellent climbers and are often photographed scaling trees. Their claws give them great grip, and the branches offer youngsters safety from predators. Black bears are also good swimmers, and will readily enter water in search of Juneau’s smorgasbord of salmon. Average lifespan is around ten years, they can live upward of 30 years in the wild. Despite their name, black bears are not always black – they can also be light brown, blond or even grey-blue. Female black bears give birth to up to 6 cubs, and usually breed every other year. The cubs stay with their momma for about 18 months before venturing out into the wilderness. In Southeast Alaskan culture, Bear is known as the protector of the animal kingdom. In Haida culture, it is referred to as “Elder Kinsman” and was treated like a high ranking guest when killed. Eagle down was sprinkled before it was brought into the tribe to display respect. In west coast legend, a chief daughter was abducted by a bear for insulting them. As punishment, the bear turned himself into a handsome man and seduced the woman. She conceived two sons who were half bear and half man. All Bear Clan members are descended from this woman and her two sons. Because of this, it’s believed that there is a bear within all of us. Classified as mammals and rodents, North American porcupines (Erethizon dorsatum) are also called “quill pigs”, which is what their name means in Latin. Most of the species live in wooded areas and can climb trees, where some spend their entire lives. 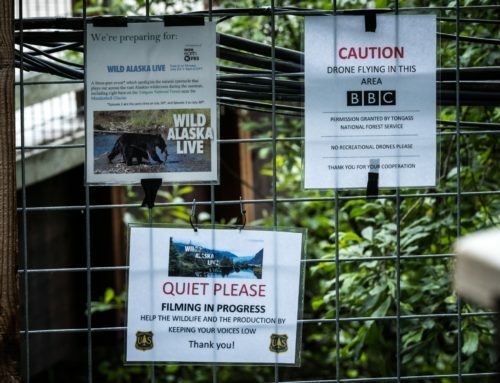 Besides a penchant for gnawing camera cables and floor mats, Alaska’s porcupines are spending their summer getting fat, very fat! In fact, by the beginning of Fall, these spikey characters are as much as 60 per cent fat. They need to, as usually for rodents, they don’t hibernate. Nocturnal, they are active primarily at night. These spiny and robust rodents weigh around 20 pounds and have a life expectancy of around 18 years but can live up to double that. Typically, they are around 2 to 3 feet long. They are one of Alaska’s most adaptable creatures as they typically eat foods that they don’t have to compete for, such as spruce needles and tree bark…or cables. As herbivores, they also feed a lot on herbs, grasses, tree bark, foliage, buds and apples. As mammals and the largest rodents on earth, North American beavers (Castor genus) possess an average weight of 45 pounds, getting as large as 70+ pounds. Typical life span is 20 to 24 years and average length is 2.4 to 3 feet. Preferring to live where there is water, they will burrow into the banks of rivers and lakes in temperate climates. Where there is no river or lake, beavers will create their own. Namely by felling trees and branches, they construct dams to form large ponds. Cleverly, beavers use swimming goggles too; they possess a set of transparent eyelids that enable them to see under water. Beavers are second only to humans in their ability to manipulate their environment – the largest dam in existence is located in Wood Buffalo National Park, Alberta, Canada. It stretches for half a mile, and is visible from space! Beaver homes, called lodges, are dome-like constructions built from branches and mud. They are positioned in open water for protection from predators and have underwater entrance holes. Beavers don’t mind the cold, they can be seen active throughout winter and maintain use of their ponds even when they are covered with a layer of ice. In Southeast Alaskan culture, Beaver is known as the carpenter of the animal kingdom, and is considered the industrious one. Beaver is said to have been a woman at one time; Tsimshian legends tells of this woman who dammed a stream to swim in it. Because she refused to get out, she was transformed and her leather apron became a Beaver’s tail. According to Haida legend, it is also Beaver who is responsible for providing the Salmon that the Raven had stolen to give back to the people. The smallest marine mammals in the world, Sea otters (Enhydra lutris) are well adapted for their predominately aquatic lifestyle, possessing a strong, rudder-like tail and large hind-feet that act as flippers. Unlike other marine mammals, sea otters do not have blubber and instead rely on their fur to keep warm in the water; their reddish-brown coat is the densest of any mammal. The natural oils produced by the fur provide a waterproof quality. As one of the few animals that use tools, they utilize rocks to crack clam shells for example, but have been seen using glass soda bottles and cement blocks. Unusually, sea otters have built in pockets under their arms. Their fur has 10 times the hairs per square inch than we have on our entire head. (Humans 100,000; otters 1,000,000.) Otters’ teeth are strong enough to bite through the spines of a sea urchin, or crunch a clam shell open. Wild adult sea otters can reach up to 100 pounds, range from 3 to 5 feet long, and eat at least 25 per cent of their body weight per day, or more than 12 pounds of seafood. That’s the equivalent of a 150-pound human needing to eat 37 pounds of food a day! For sure, you’ll see a lot of other wildlife. Ravens for example, and lots of them. Some mosquitoes, too. You might even see a hummingbird, and salmon if they’re running. Information cited from: Understanding Northwest Coast Art – A Guide to Crests, Beings, and Symbols by Cheryl Shearar, Looking at Indian Art of the Northwest Coast by Hilary Stewart, University of Michigan Museum of Geology, eagles.org, The importance of fish to bald eagles in Southeast Alaska: A review by R. Armstrong, fws.gov, nationalgeographic.com, noaa.gov, naturemappingfoundation.org, environmentalaska.us, nationalforests.org, onekindplanet.org, kidskonnect.com, arkive.org, discoverwildlife.com and uas.alaska.edu. 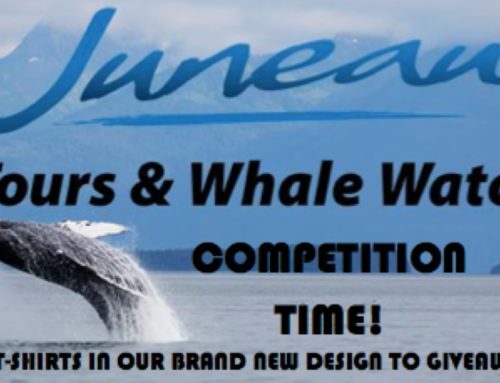 By twowheelednomad| 2018-06-06T08:40:10-09:00	August 29th, 2017|Uncategorized|Comments Off on What Wildlife Will I See in Juneau, Alaska? The British have commandeered our newest boat! How to dress for Alaska! Best things to do in Juneau!